As race relations in the United States become increasingly heated, titles like March: Book Two are desperately needed to remind people of the hardships endured by this country’s black population. 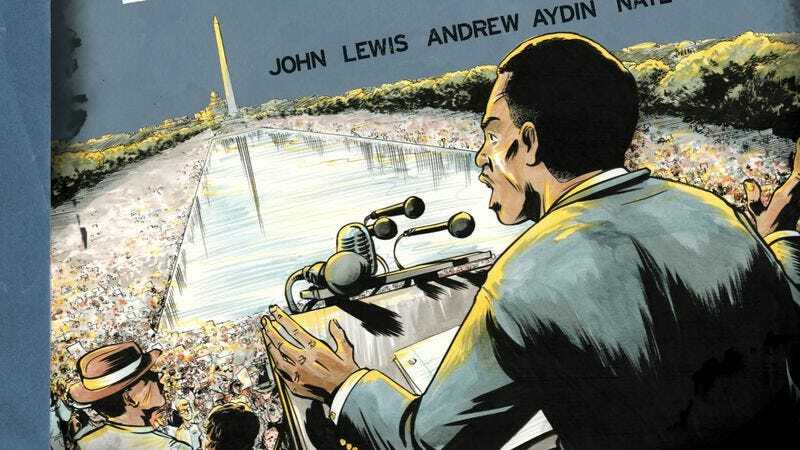 The second installment in a planned trilogy by Congressman John Lewis, co-writer Andrew Aydin, and artist Nate Powell, this graphic novel covers major moments in the civil rights movement from November 1960 to September 1963, a period that included the Freedom Rides, Martin Luther King Jr.’s “Letter From Birmingham Jail,” and the march on Washington, D.C. that changed the U.S. forever. These past events are paired with scenes from President Barack Obama’s inauguration in 2009, showing how the work done by brave men and women in the ’60s opened the doors for later generations to rise to power. It’s vitally important to remember the sacrifices made to get to that monumental moment on January 20, 2009, and March: Book Two chronicles these past trials and tribulations in heart-wrenching detail. March: Book One was a solid beginning, but it suffered from some awkward exposition and ended just before the landmark developments of the civil rights movement. With the background information out of the way and loads of significant moments to cover, March: Book Two is a dramatic improvement that highlights how Lewis and Aydin skillfully immerse the reader in past events and Powell creates powerful images full of expression and emotion. As the only living member of the “Big Six” that helped organize the landmark march on Washington, D.C., Lewis has an invaluable perspective on the civil rights movement, and he’s retained all the details from his experiences to make March an incredibly thorough look at this period in U.S. history. Fans of the film Selma, which features Lewis in a significant role (played by Stephan James), should quickly seek out this graphic novel, which ends at almost the exact moment when Ava DuVernay’s film begins. The march from Selma to Montgomery is the focus of the as-yet-unannounced final book of the March trilogy, and the series begins with Lewis on the Edmund Pettus Bridge pondering the possibility of swimming to safety if circumstances take a turn for the worse. Part of what makes Selma so captivating is its focus on one specific event, letting the audience feel the full intensity of this particular struggle, but there’s an expansive backstory to that film that Lewis, Aydin, and Powell vividly break down in the pages of their graphic novels. Lewis and Aydin deliver an affecting script in March: Book Two, but most of the storytelling weight falls on Powell, who interprets these historical incidents in a way that puts the reader in Lewis’ shoes. His settings and characters are meticulously detailed, but his layouts do the hard work, capturing the mood and atmosphere of specific moments through panel structure and page design. When Lewis and his comrades are locked inside a department store with a running fumigator during a sit-in at the store’s food counter, Powell depicts the scene with excessive darkness that overwhelms the small panels showing the people trapped inside. That scene is a start contrast to the splash page revealing the Mississippi prison where Lewis is sent after participating in the Freedom Rides, which highlights the desolation of the 21,000-acre prison grounds. Powell does particularly excellent work with splashes like this, using the full space of the page to deliver visuals with immense impact. One of the most hard-hitting sequences transitions from a vicious attack on the Freedom Riders to Aretha Franklin singing “My Country, ’Tis Of Thee” at President Obama’s inauguration, shifting from hectic multi-panel layouts to an inspiring two-page splash of Franklin belting in front of the U.S. Capitol. 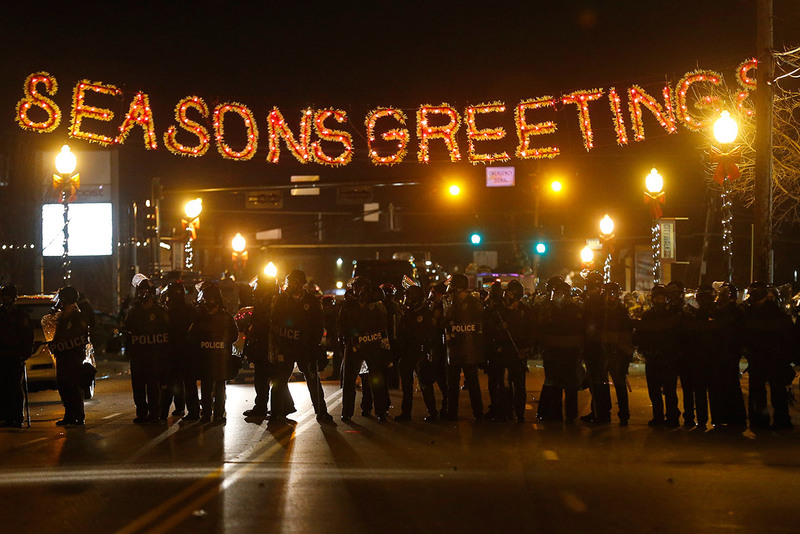 Some of the imagery can be a little on-the-nose—a brick smashes the face of a stained glass Jesus as it’s hurled into a church—but as certain images from the past few months have shown, reality doesn’t always equal nuance either. This second volume builds to the march on Washington, D.C., highlighting the numerous beatings, killings, and imprisonments along the way. The fact that it can be a tough read at times just means that the creative team is doing something right. These events shouldn’t be easy to absorb, and the remarkable work done in this graphic novel makes the audience feel Lewis’ pain, frustration, and anger during this passionate time in his life. His strong attachment to this period shines through in the writing, which intensifies with each turn of the page. Lewis has had an authoritative control of language since his youth, as evidenced by the speech he delivers outside the Capitol in the book’s final moments. While March: Book Two doesn’t depict Dr. King’s iconic “I Have A Dream” speech, Lewis and Aydin capture the force of King’s words in their narration. Lewis’ speech is paired with visuals that show the massive crowd assembled for the march, but Powell takes a minimalist approach to Dr. King’s splash page, making the reverend a bright beacon of light against a black background. The words of Dr. King’s speech are well known, and this splash page is less concerned with the content and more focused on how the message resonated with the people in attendance and the nation at large. There are some truly moving moments in March: Book Two, but what separates this volume from the first one is the emphasis on the terror and fear experienced by blacks during the civil rights movement. It can almost be considered a horror title, creating a disturbing atmosphere that leaves the reader deeply unsettled by its final page. This tone is accentuated by the concluding scene, which follows up the triumphant march on Washington, D.C., with the bombing of the Sixteenth Street Baptist Church in Birmingham, Alabama, ending the story with an event that reveals just how much work is left to be done. That work is still being done in the present, and John Lewis is still a part of it, fighting to create a United States that is truly equal. His story is an essential piece of this country’s history, and March: Book Two brings it to the page with incredible power that makes this graphic novel an unforgettable read.